The talks with the government of Naboo to set his church up seemed to be going well. The Archbishop was here on a mission of sorts but it wasn't for the Penumbra, no this was to set up the church and any sort of intelligence he could for the Penumbra. 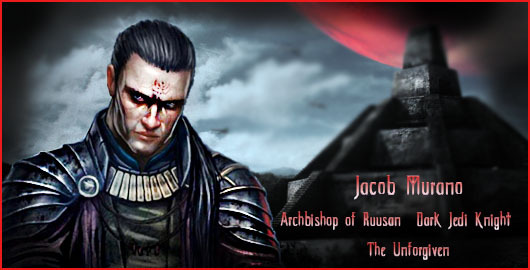 Alright, it was sort of for the Penumbra but in truth Jacob came here also because the Force was strong in certain areas of the planet. As he made his way from the central part of Theed to the outskirts he then came across a lake that was pointed out to him. From what he could feel the Force was present here. Not as strong as some other areas but here he may find balance. After showing his fellow Dark Jedi, Ashaiya he felt the darkness pulling him further into 'The Night' as he called it. Jacob was all about trying to find a balance with his darker abilities. Not completely giving in but at times he struggled. Just as he was now struggling not to step outside of the eye within the storm. At times a voice would speak to him which was either the Force itself or something else entirely. He could never tell and it was curious to him that he'd hear it. It also spoke to him back when he'd had visions which didn't come to pass thankfully. Seemed to be a possible outcome but again he was thankful that it didn't. The former Jedi Knight looked up at the sky as it finally got dark enough. There was chirping of birds, skittering of other creatures which didn't bother him at all. He wasn't in his Dark Jedi persona but he was just himself as he was. As the Archbishop of Ruusan, of the Church of the Great Creator. Sitting by the lake the Dark Jedi took in the Force trying to keep himself balanced but it was a struggle. Although he fluctuated between letting his emotions take over he then heard that familiar voice call out to him. Closing his eyes he then kept listening to that set of words spoken to him. Shaking his head he wasn't gonna let himself fall completely to the dark again. Breathing deeply in and out he then meditated upon the words that he heard. He wasn't gonna give "into the night" as it said. Not ever would that happen to the former Sith and Jedi. He found his balance in life and the Force. He couldn't let his emotions control him anymore. The Knight had to keep himself in check. Anyway he could. But as he then kept meditating things floated into the air a bit as he was frustrated from the words that he'd heard in his mind. Though he didn't know what they all meant. Although the last was what he knew as completely giving into the Dark Side. The Force, had it's riddles for him and at times he didn't know how to solve them. At this moment he then tried to keep his focus. He then smiled for a moment as he recited what he said at times connecting to the Force.